Well Annan Athletic certainly turned on a superb second half performance to defeat top of the table Peterhead on a miserable wet day at Galabank. It certainly was a dent to Peterhead’s title aspirations who had goalkeeper Greg Fleming to thank for a series of superb saves throughout the match to deny a rampant Annan attack who opened up the Peterhead rearguard throughout the match. Annan boss Peter Murphy was forced to make changes to his starting line up with Peter Watson and Steven Swinglehurst combining at the centre of the Annan defence for the first time this season and with Ryan Sinnamon picking up an injury in training it meant a return to right back for the versatile Scott Hooper in a back four which was rarely breached by a disappointingly lack luster Peterhead attack. The Peterhead line up surprisingly ommitted prolific goal scorers Rory McAllister and Russell McLean both of whom were included on the substitutes bench and although both players were introduced after Annan had romped into a two goal lead both strikers found it difficult to penetrate the resolute Annan defence where Swinglehurst and Watson formed a formidable partnership. The opening exchanges were fairly evenly contested until Greg Fleming pulled off a superb 12th minute save to deny Tommy Muir as Annan broke from the centre of the park masterminded by a penetrating Chris Johnston run who released the Annan striker in on goal and Fleming read the situation perfectly saving Muir’s well placed low shot with his feet. Moments later Gibson floated in a dangerous cross aimed for the head of Lyle but the cross floated to safety. At the other end David Wilson’s penetrating ball almost released Hooper in on goal, this was followed by a Gibson Free kick which went aimlessly past the post. Peterhead started to dictate a period of play and Annan had to be on their game to keep the Blue Toon attack at bay. As the match approached half time it was Annan who started to take control of the match but without creating any danger to the Peterhead defence. 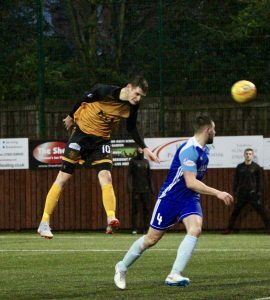 Annan started the second half on the attack with Moxon forcing an early corner kick from which Tony Wallace struck a crisp shot through a ruck of defenders and safely into the arms of Fleming. Minutes later Annan got the all important opening goal. It was a goal to savour as David Wilson picked the ball up in his own half, drove forward to the edge of the box and finished with a glorious low raking shot which cracked the inside of the post before ending up in the opposite corner of the net. It was a defining moment in the match and Peterhead looked uneasy as Annan pushed forward forcing the visitors to defend and it took another fine save from Fleming to deny Aidan Smith. The Peterhead keeper however could do little to prevent Annan’s second goal in the 61st minute. Chris Johnston was the creator as he tormented the Peterhead defence down the right finishing with a low cross to the feet of Tommy Muir who dispatched the ball low and into the corner of the net past the helpless Fleming. It was a magic period of the match from Annan and one which Peterhead never recovered from and it took another instinctive save from Fleming to deny Tommy Muir in the 68th minute, then within a minute Tommy Muir headed Annan into a 3 goal lead when the provider Chris Johnston picked him out with a great cross and Muir powerfully headed the ball into the corner of the net to push Annan 3 goals up with only 70 minutes on the clock. Annan were in rampant form with Fleming again saving Peterhead’s blushes to deny Muir his hat trick in the 74th minute pulling off a fine save with his feet as the Annan striker homed in on goal, the big keeper then pulled off another instinctive save to deny Aidan Smith. The introduction of McAllister and Wilcox gave Peterhead fresh legs but it was too late for Peterhead to change their fortunes, Mitchell who had been rarely troubled all afternoon was then called into action to deal with McAllisters low shot in the 83rd minute. Gibson’s 85th minute free kick was punched clear by the Annan keeper for a late corner but the Peterhead attack for once this season failed to penetrate the Annan defence. Annan Athletic – Alex Mitchell, Scott Hooper, James Creaney, David Wilson, Peter Watson, Steven Swinglehurst ,Tony Wallace , Owen Moxon, Aidan Smith, Tommy Muir ( Ross Ferguson 87 min), Chris Wallace . Subs not used Aidan McCadams GK, Lewis Strapp, Peter Murphy , Harry Emmerson. Peterhead – Greig Fleming, Jason Brown, Patrick Boyle ( Ross Wilcox 76 min ) , Cameron Eadie, Michael Dunlop, Ryan Dow, Jamie Stevenson ( Rory McAllister 65 min ), Scott Brown ( Russell McLean 76 min), Derek Lyle, Jack Leitch, Willie Gibson. Subs not used – Sam Henderson GK, Callum Home.